In a saucepan bring to boil for 1 minute the syrup ingredients (water 150 g, sugar 175 g, glucose 43°DE 25 g), after having mixed them. Let cool at 25°C and combine the peaches pulp, then add the cooked meringue and, lastly, the whipped cream with liqueur. Whip the eggs with the sugar, then combine the two flours, make the layers desired on the parch paper, using the sac-à-poche. Cook in the oven at 220°-230°C for 8-10 minutes. Use immediately or cover and put in a fridge. Whip the yolks with sugar and glucose until a smooth cream is obtained. Then combine the cooked meringue and finally the whipped cream with the liqueur. On the bottom of the mould, place a layer of normal biscuit dough, lightly soaked with vanilla sauce, then put a thin layer of syrupy peaches. 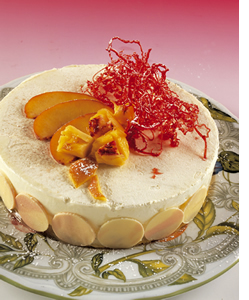 Place the peaches semifreddo on the top, until it reaches halfway up the mould and then complete with the vanilla cream semifreddo. 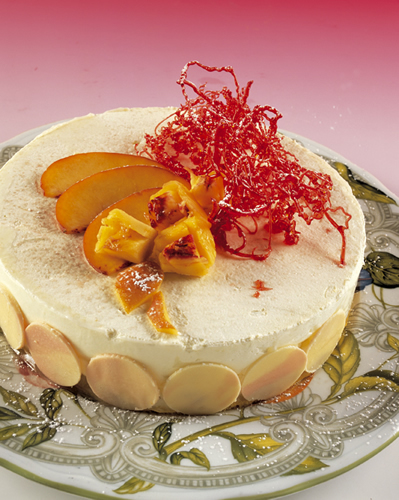 When cold, glaze completely with peach or clear cold gelatine, garnish around with white chocolate discs with pink shades and complete with red caramel strings and sliced and glazed peaches.